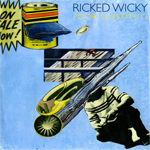 Original Release Notes: Two new singles from the upcoming third album from Dayton, Ohio-based supergroup RICKED WICKY. The quartet, led by ROBERT POLLARD and seconded mostly by multi-instrumentalist NICK MITCHELL, with assists from KEVIN MARCH on drums and TODD TOBIAS on bass, have amped Pollard's already wildly prolific output to Jason-Statham-in-Crank-2 levels. The band serves up the same gleefully messy prog / punk / pop stew as on the previous two Ricked Wicky releases, but there's a growing sense of assurance evident on the newest record that indicates Big Things for the future.